Are you instead looking for the unchained rogue? You’ll find it here. Rogues are proficient with all simple weapons, plus the hand crossbow, rapier, sap, shortbow, and short sword. They are proficient with light armor, but not with shields. The rogue’s attack deals extra damage anytime her target would be denied a Dexterity bonus to AC (whether the target actually has a Dexterity bonus or not), or when the rogue flanks her target. This extra damage is 1d6 at 1st level, and increases by 1d6 every two rogue levels thereafter. Should the rogue score a critical hit with a sneak attack, this extra damage is not multiplied. Ranged attacks can count as sneak attacks only if the target is within 30 feet. See Precision Damage & Critical Hits FAQ for more information. Talents marked with an asterisk add effects to a rogue’s sneak attack. Only one of these talents can be applied to an individual attack and the decision must be made before the attack roll is made. A rogue of 8th level or higher can no longer be flanked. Regardless of the effect chosen, the target receives a Fortitude save to negate the additional effect. The DC of this save is equal to 10 + 1/2 the rogue’s level + the rogue’s Intelligence modifier. Once a creature has been the target of a master strike, regardless of whether or not the save is made, that creature is immune to that rogue’s master strike for 24 hours. Creatures that are immune to sneak attack damage are also immune to this ability. Instead of receiving an additional skill rank or hit point whenever they gain a level in a favored class, some races have the option of choosing from a number of other bonuses, depending upon their favored classes. The following options are available to the listed race who have rogue as their favored class, and unless otherwise stated, the bonus applies each time you select the listed favored class reward. By their nature, rogues are varied and versatile. There are rogues who haunt the city, those who stalk the forest, and those who serve as agents of law. 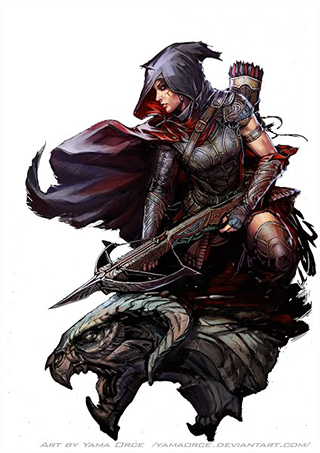 Wherever there is space for someone to make her mark with agility and wit, the rogue is there, using her wide range of skills and abilities to make a place for herself, whether openly or through cunning and subterfuge. And where a rogue’s natural cunning and quick thinking aren’t enough to win the day, well—there’s always the option of a knife in the back. The following themes represent some of the most popular and effective roguish Archetypes. Each archetype comes with one or more class features that must be taken. In addition, each archetype includes a number of new rogue talent suggestions that, while not mandatory, help to flesh out the character.